I was so excited when this book first came out. First of all, I am a HUGE fan of the short story genre. It was my favorite thing to read in school and my favorite to teach to my freshmen in high school. Truly great writers can tell such a good with only a few pages. Secrets has seven short stories from seven different Catholic authors. Each author has written other novels and though I have only read two of these authors outside of this novel, I thoroughly enjoyed each story. The stories are also each from a different genre and most use characters from the other books the authors have written. I was happy to be introduced to some of authors I haven’t read before. I’ve added quite a few more books to my reading list! But probably the most important thing about each of these stories is that they are all young, teenaged protagonists. They fight injustice, struggle with sin and temptation, and pray to God in a world that is against Him. This is what we hope our young adults will be when they are faced with tough situations as well. They need to see heroes like these characters. Therefore, I strongly recommend this collection. 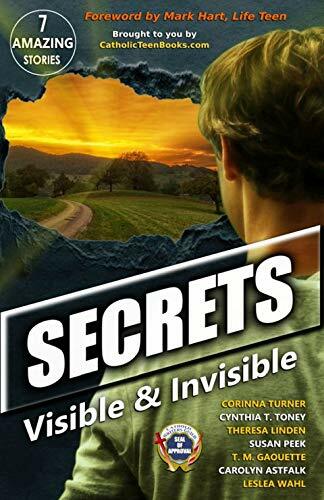 “The Underappreciated Virtues of Rusty Old Bicycles” by Corinne Turner is a dystopian story that tells of the adventure that two characters have while nearly getting caught by the terrifying government under which they live. “Recreation” by Cynthia T. Toney is a story of two friends and their summer. One friend befriends an elderly neighbor and begins helping her. The story demonstrates the virtue of kindness and teaches that we shouldn’t judge people strictly by their appearance. “The Portrait of the Fire Starters” by Theresa Linden was so interesting! The author tells a story that encourages us to think of others in everyday situations….to open our eyes to the lives of those around us. The Catholic teen group in the story learns the lesson when they find a painting in their meeting room. From there the mystery begins. “On the Brink of Hell” by Susan Peek takes us back in time to 16th century Italy where a young boy has just been wounded by a cannonball. As he fights for his life he has a battle of the soul as he fears he will not make it to heaven and needs a priest. The story has a great ending! “Sister Francesca” by T. M. Gaouette was my favorite story in the book. It’s an innocent story of a boy with a crush, but delves into the truth of God’s call in regard to vocations. I absolutely LOVED the end of the story, it was unexpected but made me so happy. “Behind the Wheel” by Carolyn Astfalk is a piece of contemporary fiction that I feel would apply to many teens. A young man takes his dad’s truck without permission and is presented with a moral dilemma. It’s a good story of integrity and would be great for discussion between parents and kids. “More Precious than Gold” by Leslea Wahl takes some of her characters from her other novels and puts them together. If you’ve read The Perfect Blindside and An Unexpected Role you will recognize the couples from each book. Ms. Wahl writes another great mystery that young adults will love. I have no concerns with this collection as long as the reading level is kept to middle/high school. Which protagonist demonstrated the most faith? In what ways do some of the characters have to fight for their souls? Which story teaches the strongest lesson of faith? Which story makes you want to read more by the author? Which character do you admire most? Teaching the genre of short stories is generally pretty straightforward, but if you are looking for quick refreshers, here are some cute ideas from Reading and Writing Haven. Choose one author for the stories presented, find out more about the author and write a short bio. Find more books by the author and read them. Promote the author in your local library by donating some of their books when you are finished or you can request they carry them at the library! Write your own Catholic fiction short story. Be sure to include the essential elements of fiction. Setting is so important to a story, especially some of these. Analyze the setting of the story and discuss how it impacts the story as a whole. You can use some information from Bright Hub Education. Write a character analysis of one of the characters. You can use these graphic organizers to help. Mark Hart, The Bible Geek, writes a preface to the collection. He has written many books geared toward young adults. You can see his books here. It’s important to support our Catholic authors. They work to provide us art that we can feel good about supporting. Use some of the ideas above to help promote these Catholic writers. Read more about supporting the Catholic arts in this article from The Imaginative Conservative. Find a saint to admire and learn about. Perhaps your confirmation saint? A modern saint? You can use this list from Life Teen to help you choose one. Compare and contrast a Catholic saint to one of the protagonists in the story.